Posted by Admin on May 5, 2010; This entry is filed under New Products. Natural thin stone veneer is a real stone product quarried from the earth and then cut to a thickness of 1¼-inches. We can also cut other sizes for custom jobs. Here at Stoneyard Building Materials we use a large saw to cut just the stone’s visually appealing front area, creating a highly aesthetic stone facing that offers a permanent finish with a unique look. Natural thin stone veneer ages well and gains character with time, in contrast to synthetic products (e.g., fake stone), which tend to look worse with age. Natural stone is virtually maintenance free. In a moderate climate like Santa Barbara the stone doesn’t need to be sealed, so there are no sealer maintenance issues, and also no discoloration of the natural stone as often occurs with sealants. Natural thin stone veneer resists chipping and scratching, and if it is nicked or scratched the look will not be affected because the stone is consistent throughout, unlike artificial stone products. Our sandstone thin veneer is about one-third of the weight of full-dimension stone, meaning three times as much can be shipped at once, which saves on shipping costs and lessens the environmental impact. Thin veneer stone is also quarried and cut locally, creating local jobs. 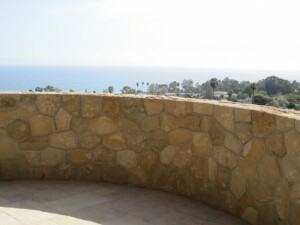 This product is installed at numerous locations, here in the Santa Barbara area, both residential and commercial. We’ll be posting more pictures and information on our website in the near future. Let us know if you have any questions and, as always, we’d be happy to help you design or estimate your next project. You can leave questions or comments below or contact us any time.